I know there's a lot of threads being revived about a Vac Sys station and rather than add on to the others I'll just start my own. I've been thinking about making one ever since I got the unit back in September mainly because I wanted something I could move around with me as my needs during a project change. 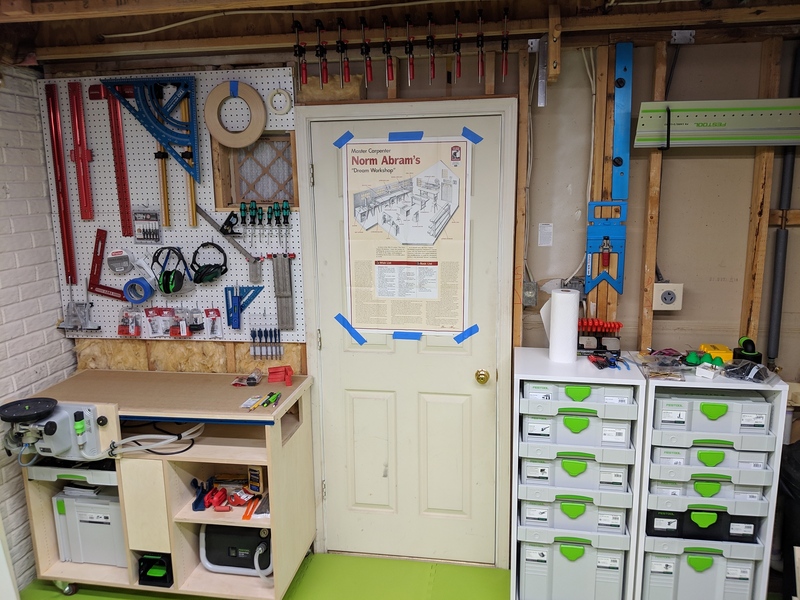 Having it fixed to one location in my space was problematic because I found if I had stuff on the adjacent bench then I'd have to move it to use the clamping module. 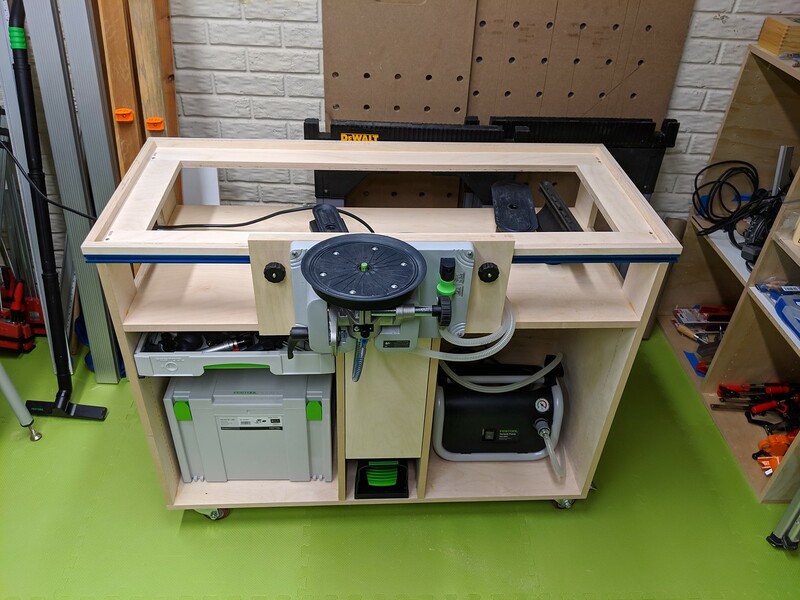 I came across a nifty Shaper Origin cart that @neilc designed over on the Origin forum and thought it'd make a good base for what I was after. I exchanged a few emails and texts with him and he was generous enough to share his SketchUp file with me. 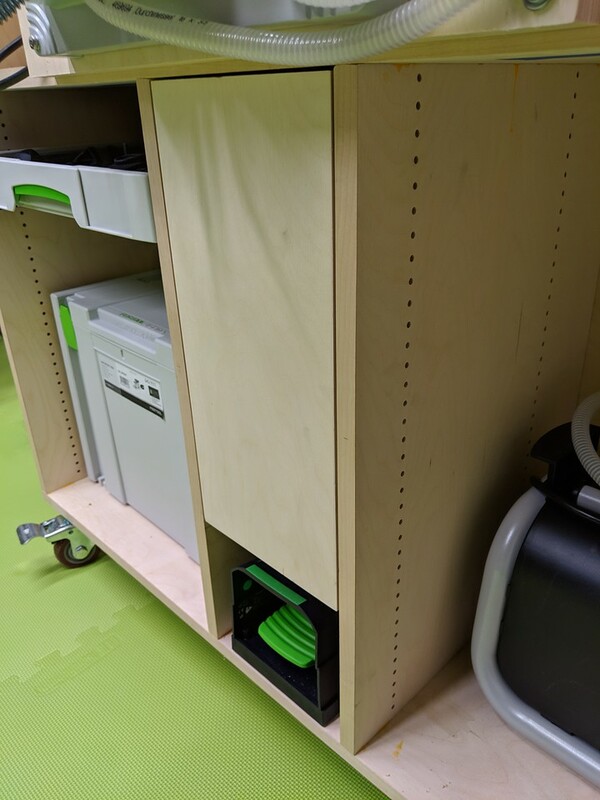 I have the base unit completed and going to put it to use for a bit before I decide how I want to attach a top to work with the Vac Sys module beneath. Neil and I have already bounced some ideas on that back and forth but I feel I need to use it for a bit before I settle on a design. Being relatively new to woodworking this was the most complicated project I've taken on. I made some mistakes but nothing I couldn't recover from. The glue up did not go well mostly due to my inexperience. Too many pieces fitting together with Dominos plus the back panel. I'll make some design changes next time something like this comes up and plan better. As Sedge would say. . .I hope this helps! Looks great Matt! Glad the plans helped out. Did you edge-band the sheets? 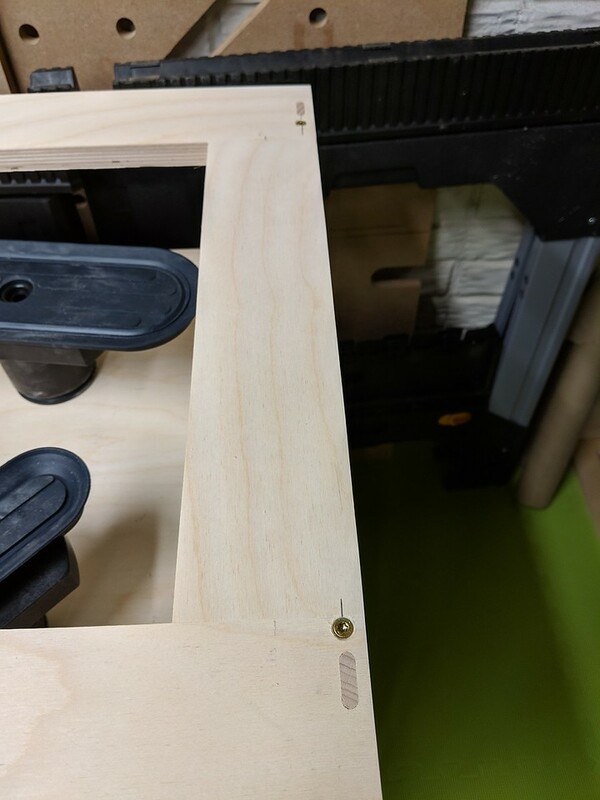 I like how you used the router to bore the inserts for the casters. Nice clean and manageable way to do that. Thanks Neil. I'm really happy with how it has turned out so far. Yes I picked up an MFK 700 for edge banding around the same time as the Vac Sys. It's a dream using them together on panels. I know from past experience I'm no good at drilling straight holes so I went with the router for the inserts. The bit was pricey but I figure it'll get used on every cart type thing I end up building. The hardest part was lining the router up to my layout lines so close to the edge of the material. Sort of get it close as you can and cross your fingers type of thing. You are now 'all in' on this woodworking thing and it shows. When you get your Shaper, those kinds of caster inserts become really easy! I did mine with the Shaper. But did not do inserts which I think is a great idea. 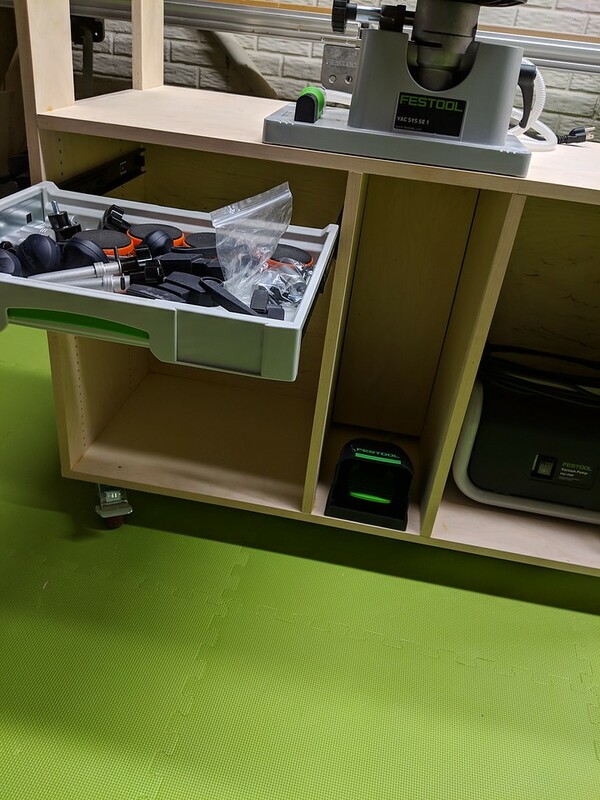 @DynaGlide I am in the same spot where I am looking to get a drill press and I am not sure why in the world I didn't think of just using my router. 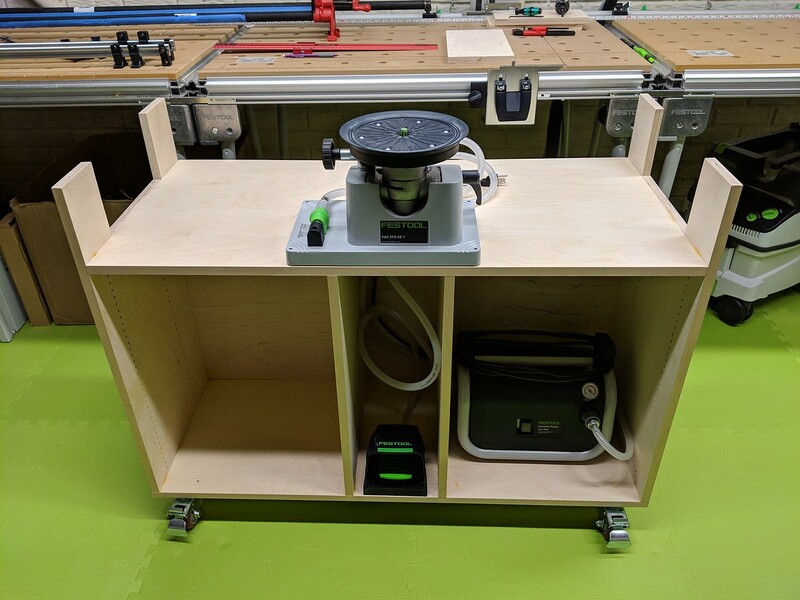 Which do you use for drilling and would you recommend it over buying a drill press. 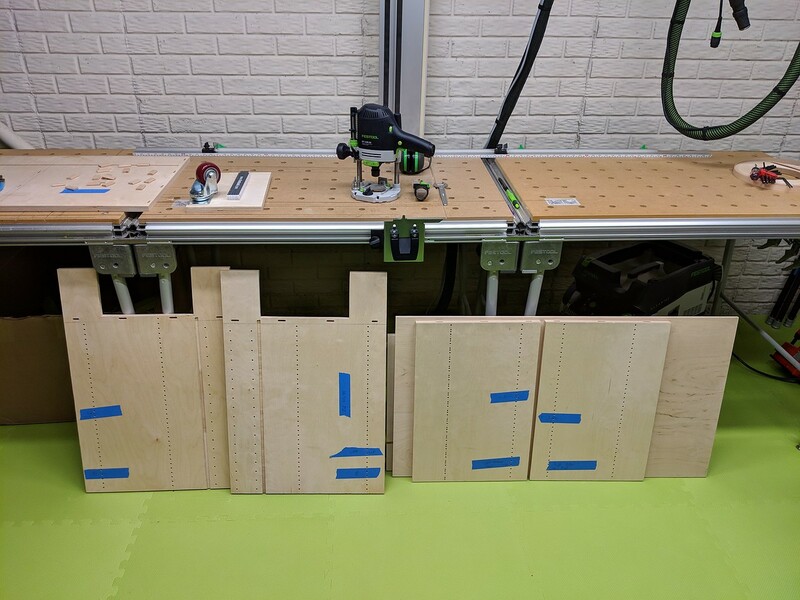 To me, it seems like a no brainer to buy an extra router vs a drill press. I actually don't own a drill press. And if I did I wouldn't want to try to wrangle a large panel on it. 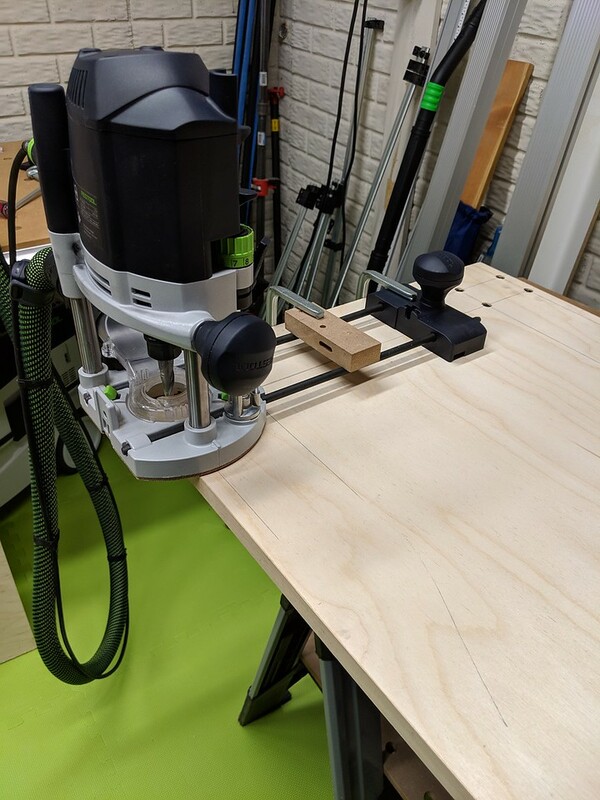 The downside to using a router is it is clunky to clamp the router in place near the edge of the material, but it works, and the spiral bits for this kind of operation can be expensive. But I really didn't have a good way of doing it otherwise. 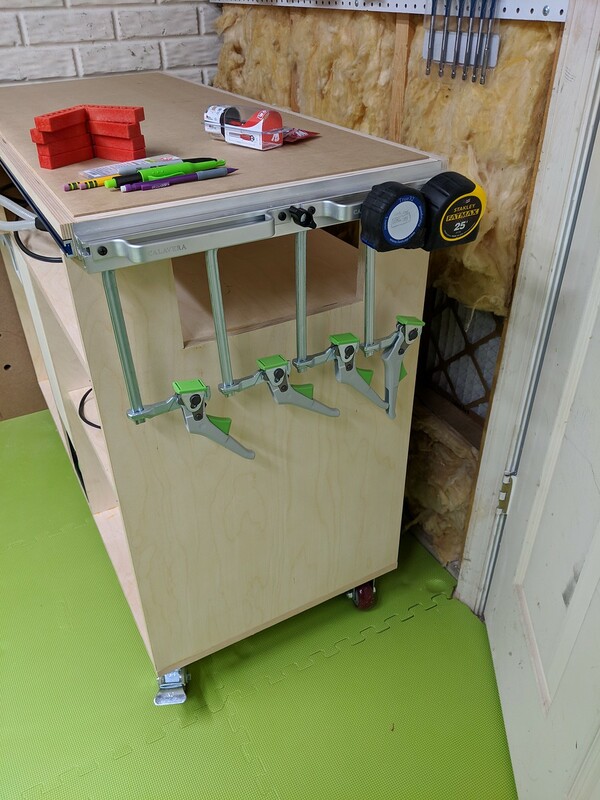 What if you clamped a rail across the piece and used the guides and rods you have and two of the rail clamps that come with the saw / router to slide the router along the rail, index to the hole you wanted, then clamp in place with the rail clamps on either side of the rail guide and plunge. That should give you dimensional stability in two directions for the plunge. You can also use two anti kickback stops to prevent the guide stop from moving instead of clamps. Yes - that's what I was thinking about! Forgot the name for those stops.. I tried that but with the router hanging over the edge there is nowhere for the leveling foot to rest. I don't own the thicker base. Next tine I'll put another 3/4 sheet against it for support. I wasn't thinking clearly. By any chance, can you share the sketch file or post the dimensions. I am getting some plywood in tomorrow and would love to so this as well. Also, the wood you are using is that Birch or Baltic Birch? 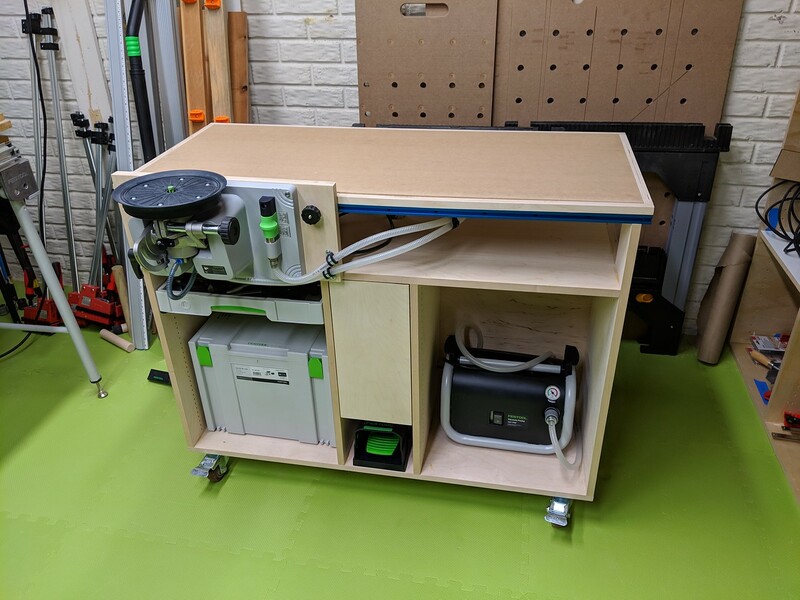 If you head on over to https://community.shapertools.com/t/shaper-station-prototype-now-with-sketchup-plans/1214/27 you will find @neilc original thread about this unit where he posted the file. The only thing I changed was I converted it to metric. 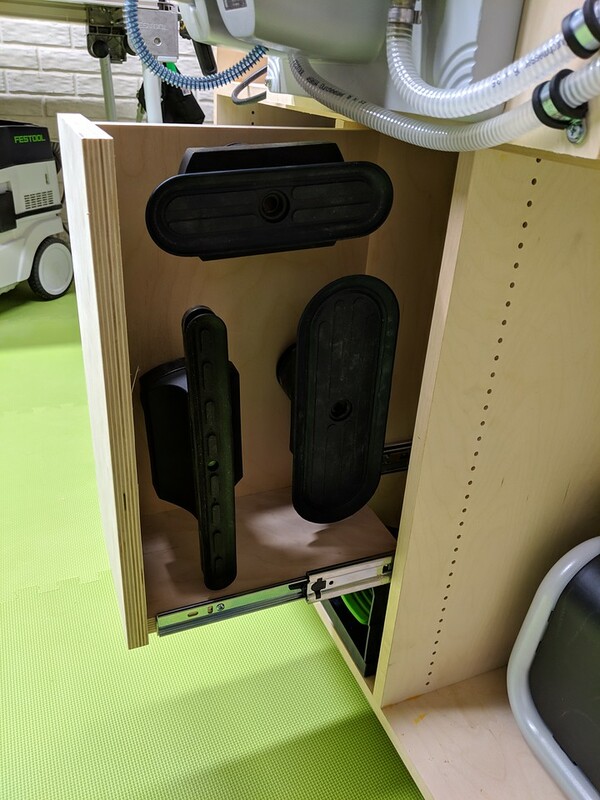 I also ordered some 10" drawer slides so I can incorporate a drawer in the middle above the foot pedal like Neil did in his. He said this is his most used bench and I can see why. I plan on keeping all my tapes, pencils, dogs, fasteners, etc in it and pulling it out whenever I work on a project. I'd love to get a Sortainer T-loc 4 to help but $170 is kind of silly for a plastic box. Thank you! Are you adding a top? Eventually. Haven't worked it out. The hardest part was lining the router up to my layout lines so close to the edge of the material. Sort of get it close as you can and cross your fingers type of thing. Here's an alternative method that I use a lot. 1. Mark your centerlines as you've noted with a SHARP pencil, then take a small sharp awl or Starrett scribe and mark the center points of all the marked holes. 2. Place the appropriate sized brad point drill bit through a centering jig. I prefer the jigs that Big Gator manufactures. 3. Extend the drill bit thru the jig and it's point will locate itself in the prick mark you made with the Starrett scribe. 4. Flip the jig and drill bit over and place it on the top surface and secure with a clamp. 5. Drill hole and proceed to the next centerline. It actually takes a lot longer to read the above process than to perform the process. If executed properly, the hole centers will fall within .005"-.008" or less of the original location. No more placing the router and crossing your fingers. Very nice job on the cabinet by the way. Me likeee. @Cheese This is hilarious I just found this yesterday and ordered one. Thank you for posting I looked for others but couldnt find them. I will look more on amazon. This is hilarious I just found this yesterday and ordered one. Thank you for posting I looked for others but couldnt find them. I will look more on amazon. They're sold in two versions. One is the jig by itself and the other one is in a plastic case. There's maybe a 50 cent difference in price. I prefer the cased version because it does a better job in protecting the jig from rust. The metal they use doesn't rust easily because of the alloys in the material. I purchase them directly from Big Gator. All wrapped up on this one. I'm pretty happy with how it turned out. Question - how do you secure the extra heads on the vertical surface? Thank you for the kind words. @neilc I experimented with routing a recessed pocket the diameter of the base of the heads but ended up using 1 3/8 dowel stock which is loose inside each head and wrapped it with friction tape from 3M. They are held snug to each dowel and easy to remove. @DynaGlide I haven't had to the time to reply yet but this build is absolutely beautiful. Did you wing it for the top since this is not the same as the original model. I am literally planning on doing this build next week I absolutely love it. Very kind words. I haven't had a lot of use with the cart yet but I'm thrilled with how it has turned out. What do you mean about winging the top? 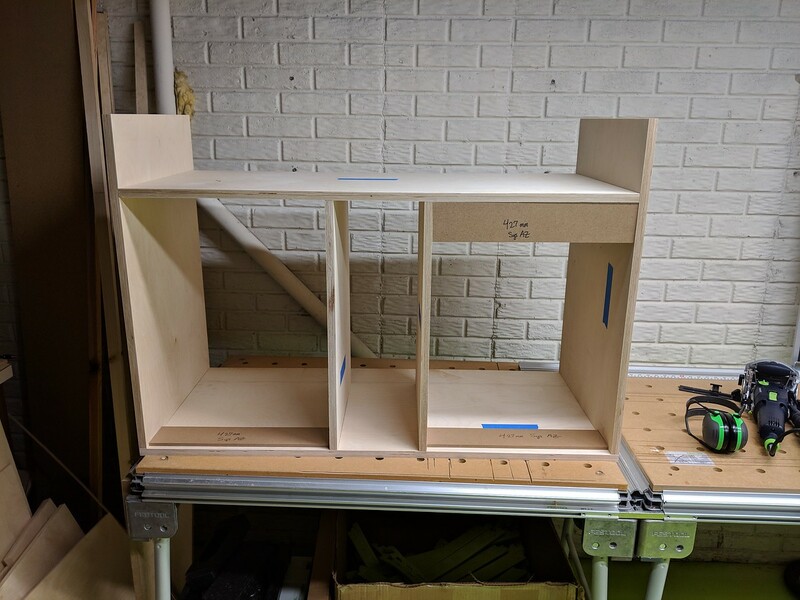 I used plywood for the entirety of the frame for the MDF top. 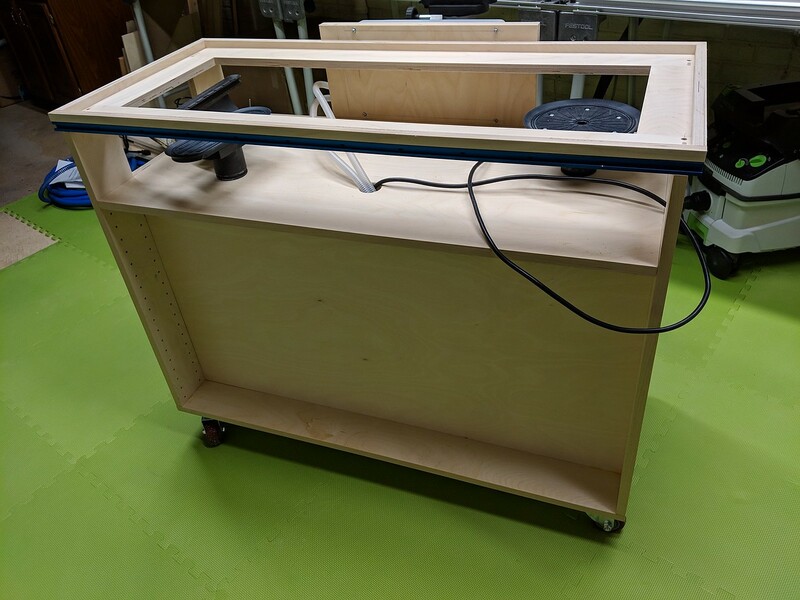 Neil used plywood for the interior frame but the outer perimeter that receives the T track he used maple hardwood. I don't have the tools to mill lumber for that purpose so I went with what I had. The top frame has a little flex in the middle if you lean on it but I don't think it will be an issue. I did reinforce the middle underneath the top with a cross member using pocket screws. The dimensions overall are pretty much the same as well I may have changed this or that as I went. 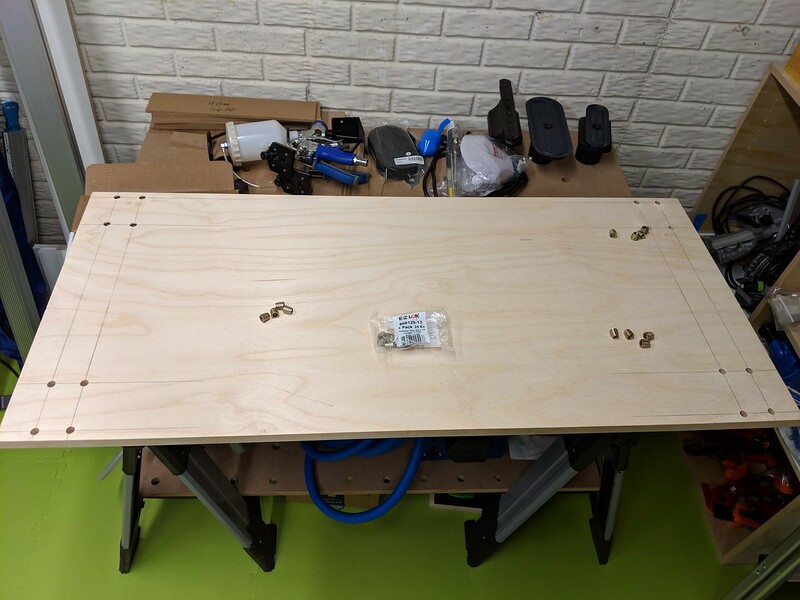 I did try to stick to the overall height of his since it's designed to clear the MFT/3 table ~900mm. I have the ability to bore the 20mm holes in the MDF I just chose not to. 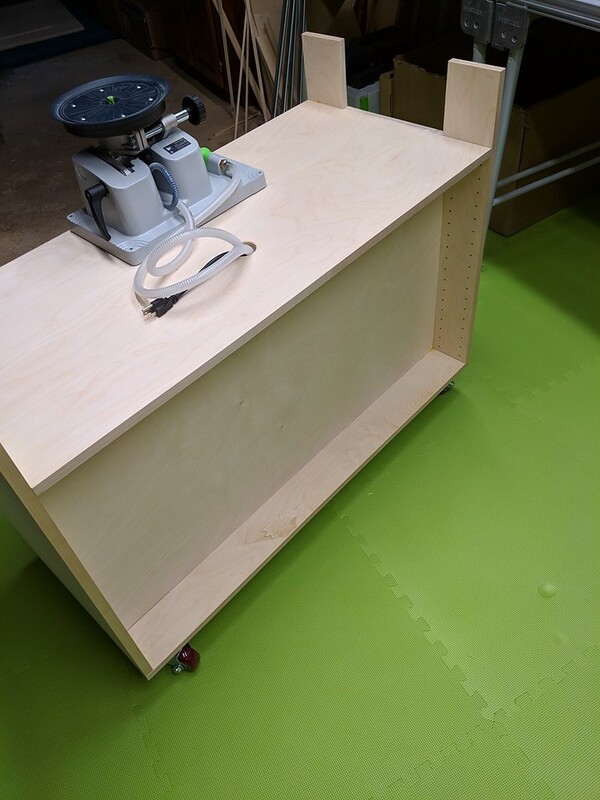 I figure I could use a bench surface without holes in it in my shop. 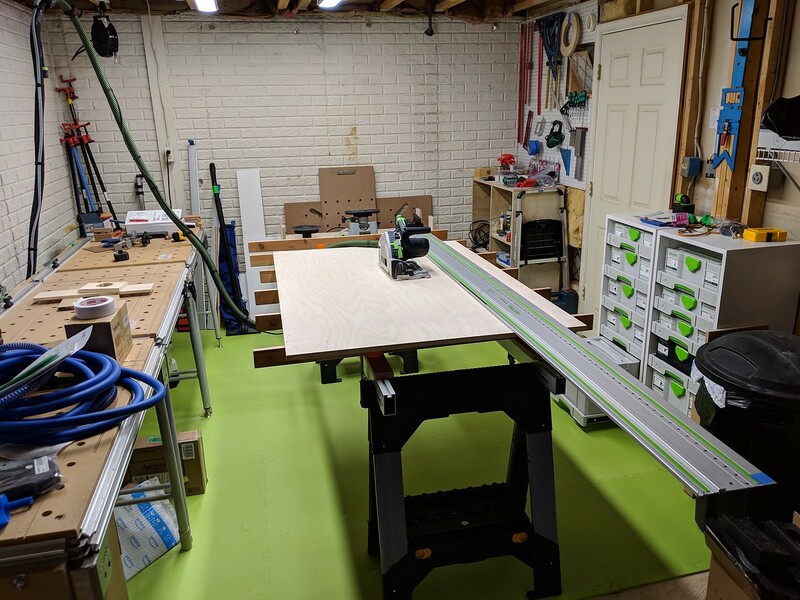 The shop is still growing. Haven't been in the house a year even. That fits nicely in the space. 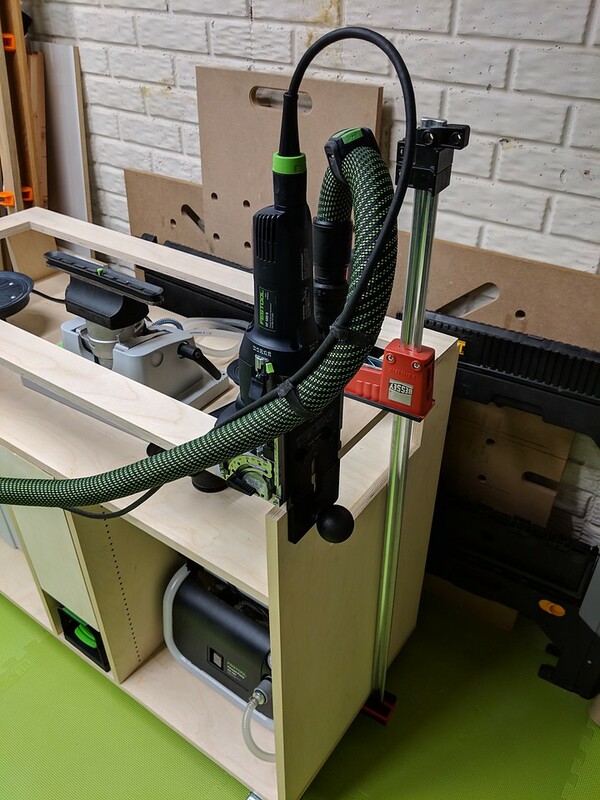 BTW, I redid the vacSys holder I had made from the Conturo manual a year or two ago similar to yours to enable quick drop-in similar to what Festool does on their road shows. 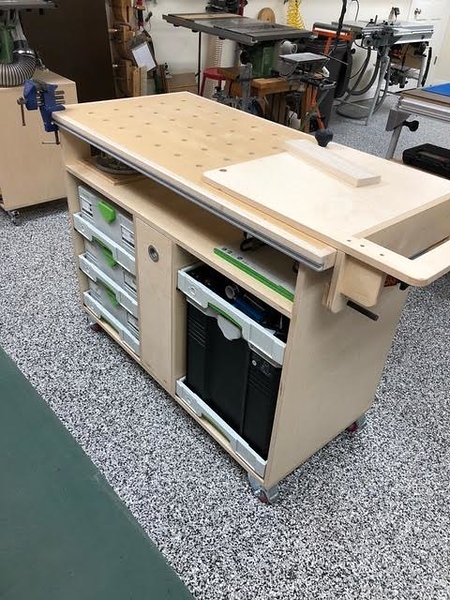 And I made it fit on the front of the mobile cart like yours rather than my MFT table. I did add a block on the bottom rear to brace against the middle shelf and it made a big difference in the rigidity. I think you set your top back to be flush with the front of the cabinet which was a good idea. Thanks for the inspiration and evolution of the design! Hey @DynaGlide Matt, you end up with a very sweet cart. Very nice. What I meant by winging it - I thought you deviated from the original plans. Looks like you didn't I am actually going to pick up the lumber for this soon and mimick exactly what you did. Going to put all these dimensions into a cut list and do it. I will post pics when I am done thank you again @DynaGlide you did a beautiful job. 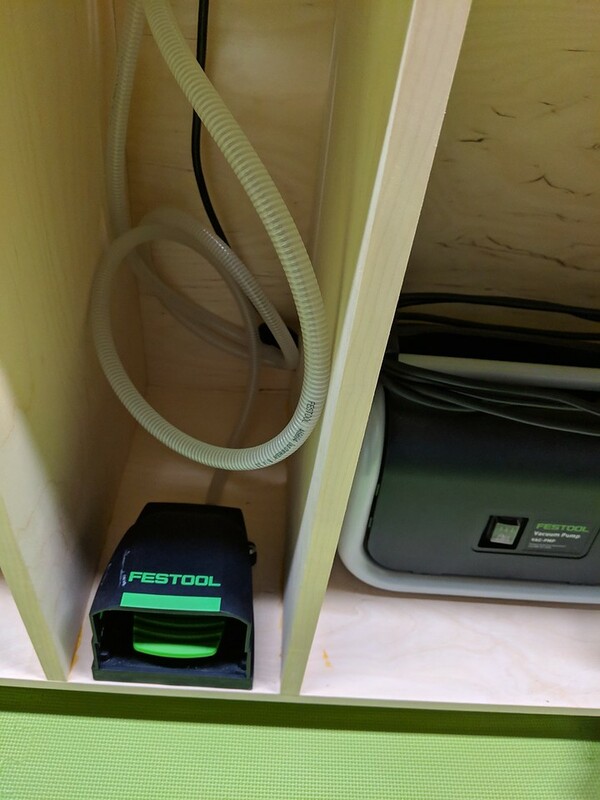 By the way, what kind of hooks are you using on your wall for your festool tracks? I did make the top flush at the front and back. Neil did not. The hooks are rubber coated from home Depot. They have a large screw on the other end. It's an okay arrangement for now. Calavera stopped producing these a while back. I wanted one for the cart and was glad to have found it. Matt, that is a very nicely executed project. Has to be motivation for others to undertake something like that. Fellows, like NeilC, ever so willing to share information makes it all the more encouraging. Where else but on the FOG? My hat's off to you - and Neil! Matt - Great idea on the Calavera holder. I have one but never thought about placing on the side of the bench for FT clamps! Hans - Thanks for the shout out! Yes this is a giving community. Makes it easy to contribute ideas and inspiration! @TSO Products Very kind words Hans.